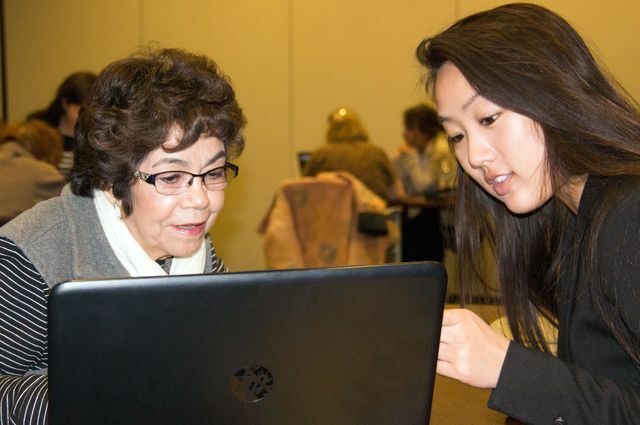 UCLA student Lauren Bui helps a woman learn how to better use a laptop. UCLA sophomore Aleena Sorfazian was looking forward to her first day at Tech Help for U. 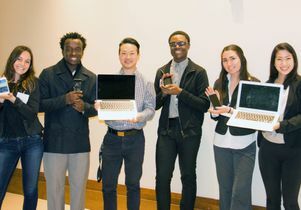 But she wasn’t a student; she was one of 20 volunteers who would be teaching older people how to better use their iPhones, iPads, laptops and other devices, as part of a community outreach program created in partnership with UCLA Health. The senior citizens waiting at UCLA Medical Center, Santa Monica on this Saturday morning were also eager for their sessions to begin as each would receive 45 minutes of individual instruction with a student/tutor prepared to answer their technology questions and coach them as they practiced their new skills. Tech Help for U was the brainchild of Jonathan Hwang, a fourth-year student preparing for medical school, and Tiffany Chen, a fourth-year student planning to become an optometrist, both of whom were already volunteers for another UCLA Health program that helps older patients fill out electronic hospital forms. The two wanted to do more to help seniors in the community, so were connected to Ishara Bailis, director of UCLA Health 50-Plus, a wellness program that provides health information, educational events and activities to seniors on the Westside and other communities throughout Southern California. 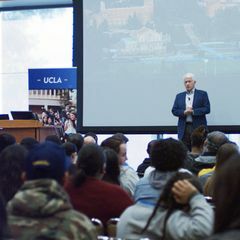 They recruited other UCLA students for the project, while UCLA 50-Plus promoted the half-day sessions in UCLA Health publications, at community talks and in doctors’ offices. Sign-ups have been brisk, and participants come prepared with their devices and lists of questions. The most common ones? How to enlarge fonts so devices are easier to read, how to download podcasts, news and music apps and how to better use social media sites like Facebook, Pinterest and WhatsApp. Myra Dell, attending her second Tech Help for U event, had already learned how to better use FaceTime to interact with her son in the Philippines, but returned to expand her Facebook and other social media skills. “I don’t like texting because I find it difficult to see the letters, but if I want to communicate with my grandchildren I know it’s my only option,” Dell said. 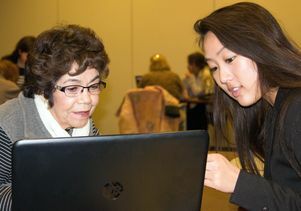 Three Tech Help for U sessions have been held at UCLA Health’s Santa Monica campus since the program started late last year, and with interest running high, more are planned for the fall. At the recent session, there were 15 participants, but more than 50 seniors have taken part in the program to date. Plans to expand to other locations on the Westside are in the works. 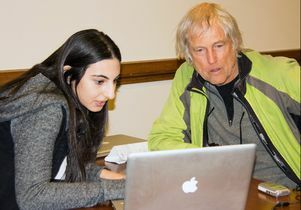 UCLA student Aleena Sorfazian shows a man how to do things on his computer, like easy ways to shop online.